Forty years ago this July, a few weeks before what would have been his seventieth birthday (on August 4), Louis Armstrong died of a heart attack in the brick shoebox house in Corona, Queens that is now a museum in his honor. The pallbearers included Ella Fitzgerald, Bing Crosby, Dizzy Gillespie, and Frank Sinatra, all of whom had shared the stage with Armstrong at multiple points over his long career. An amiable collaborator revered by other artists, Armstrong was called upon often to perform with musicians of all sorts, and he developed early mastery of the delicate art of the celebrity duet. His presence in a duo setting conferred both stature and pop appeal. Armstrong extended respect to his collaborators, out of respect for the audience they shared. I thought about Armstrong and the collaborations he did with his great peers as I listened this week to Watch the Throne, the new superstar match-up album by Kanye West and Jay-Z. I admire both Kanye and Jay-Z as artists (as I’ve said before in the pages of TNR), and I think, broadly speaking, that they compliment each other; Jay-Z can rhyme, and Kanye has a genius for production. 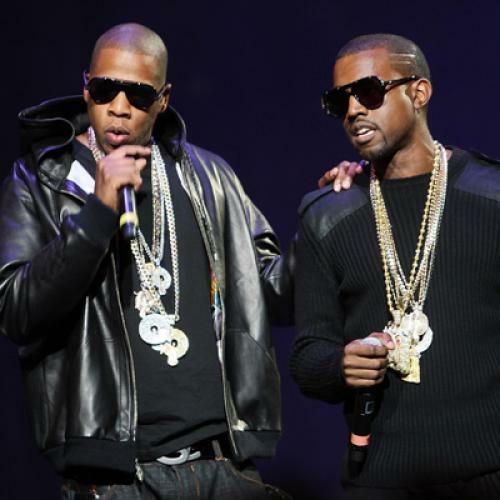 Watch the Throne is densely textured—sonically, if not lyrically—and it has a few surprising moments, including the downright sweetly affecting “New Day.” For the most part, though, the album is opulent tedium. Naturally, it revels in the narcissistic tropes of hip-hop hedonism; that’s what Kanye and Jay-Z do. For that, I give them some credit, actually. This work, absorbed with the gratifications of extravagant wealth and sexual exploitation, feels honest; it comes off as true to its makers’ experience and values, however dubious the listener may find them (and I find them abhorrent). I consider this music defensible in principle, in that it seems a genuine expression of its makers’ vile attitudes. It’s legitimately contemptible. Its terminal problem is aesthetic, rather than ethical; Watch the Throne is boring, the sound of two men who have been lounging in the VIP room, taking in unspeakable indulgences, for much too long. Boredom is one of the things Louis Armstrong would never allow, not even in his final years, when his health had declined and he could no longer play with his old facility. To show Armstrong’s gift as a duo collaborator, I tried to find a Youtube clip of him performing with Ella Fitzgerald, with whom he made three superb albums for Verve in the 1950s (including a definitive version of Porgy and Bess), only to find no footage of them. They never appeared together on television, according to the critic Will Friedwald, who knows more about pre-rock singers than anyone I know. Nor is there footage of Armstrong with Duke Ellington, with whom he recorded two fine albums of Ellington compositions in 1961. Fortunately, Youtube has preserved a rarer moment in Armstrong’s life as a collaborator: “Blue Yodel #9,” a song Armstrong had originally recorded with Jimmie Rodgers, performed on The Johnny Cash Show as a duet with Cash. Thrones are only implied. Watch the musicians.